Increasing stomach fat — especially the “hidden fat” in your abdomen — is associated with newly identified and worsening heart disease risk factors, according to a study published in the Journal of the American College of Cardiology. These adverse changes in cardiovascular risk were evident over a relatively short period of time and persisted even after accounting for changes in body mass index (BMI) and waist circumference, two commonly used methods to estimate whether someone is a healthy weight or not. 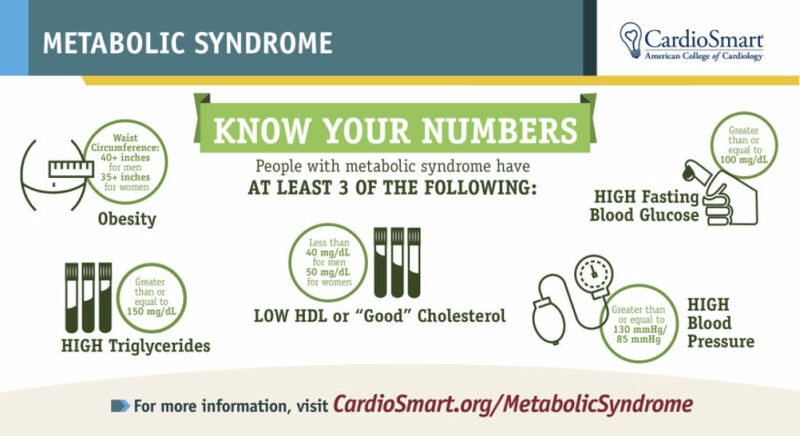 Know your risks for metabolic syndrome. Previous studies have shown that people who carry excess abdominal fat around their midsection — a so-called “spare tire” — tend to face higher risks of heart disease compared to people who have fat elsewhere. This study adds to the growing body of evidence that regional fat deposits are harmful and further suggests that the density of the stomach fat (measured by CT scan) is just as important as how much fat you have. In general, the higher the fat content, the lower the attenuation, or fat density, that is shown on the CT image. Fox said the fat density results were particularly strong. Fox and her team sought to determine whether there was a link between anatomical changes in belly fat — both its volume (quantity) and density — and changes in a broad array of cardiovascular disease risk factors during the average six-year study period. They reviewed CT scans to assess how much abdominal fat had accumulated, its location and it’s density in 1,106 participants from the Framingham Heart Study who received this imaging as part of a larger study to measure coronary and abdominal aortic calcification. Participants’ average age was 45 years and 44 percent were women. Both subcutaneous adipose fat, the fat just under the skin, which is often visible “flab” or love handles, and visceral adipose fat, the fat inside the abdominal cavity, were measured. Over the six-year follow-up period, participants had a 22 percent increase in fat just under the skin and a 45 percent increase in fat inside the abdominal cavity on average. In general, increases in the amount of fat and decreases in fat density were correlated with adverse changes in heart disease risk. Each additional pound of fat from baseline to follow up was associated with new onset high blood pressure, high triglycerides and metabolic syndrome. Even though increases in both types of fat were linked to new and worsening cardiovascular disease risk factors, the relationship was even more pronounced for fat inside the abdominal cavity compared to fat just under the skin. In particular, individuals with greater increases in fat inside the abdominal cavity showed substantial increases in metabolic risk factors including high blood sugar, high triglycerides and low HDL, or good cholesterol. Fox said that higher levels of fat just under the skin may actually be protective because it serves as a “metabolic sink for storing excess fat particles.” Abdominal cavity fat, on the other hand, is thought to be more dangerous. Overall, associations remained significant even after adjusting for changes in BMI or waist circumference. Researchers also grouped participants into three groups according to abdominal adipose tissue volume and density change; they found that those with greater increases in fat volume and more decreases in fat density had relatively higher incidence of heart disease risk factors. An accompanying editorial, by James A de Lemos, M.D., said the findings support a growing body of literature that suggests identifying the location and type of fat deposits can provide important information about the risk of heart disease not found in the simple BMI measurement. In terms of next steps, Fox said more work needs to be done to understand fat density, and why and how it is associated with metabolic consequences of obesity (e.g., hypertension, abnormal cholesterol, diabetes, inflammation and insulin resistance). As well, it will be important to tease apart how less dense fat, along with simultaneous increases in the amount of fat may spur the development of harmful cardiometabolic changes. Because this is an observational study, researchers cannot draw any causal links. Still, previous studies have associated abdomen fat to higher risks of cancer, cardiovascular events and death. Web Source: American College of Cardiology.